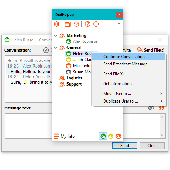 NetSendFaker allows you to Send anonymous Net Send messages to anyone that is connected to the network using the Windows Messaging Service. You can also emulate messages as if they were sent from other computer. The tool is designed with a user-friendly interface and is easy to use. Instant messenger intended for use within LAN. 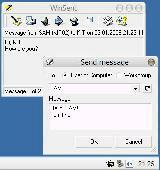 WinSent is fully compatible with WinPopup and Windows NT Messenger Service (net send). Does not require dedicated server. Works in Windows 9x/NT/2000/XP. Net Send Lite is a small utility that uses the existing Microsoft Messaging Service to send network messages. Group Net Send is a small command line utility that send messages to multiple users or groups of users. With Multi Net-Send you can Send a simple text message to one or more users/pcs connected to a NT LAN, using the Messenger Service. It has a simple but very intuitive interface. Need to send messages from your application or a script? Need to Send messages from your application or a script? Net Send GUI (freeware) and Winpopup LAN Messenger comes with a command-line tool NetSend.exe and a DLL that exports four simple functions that provide instant messaging functionality to your application. C++ and C# examples of using DLL are included. ASP.Net ViewState Helper is designed to help all web developers, but has specific features to help ASP.Net developers debug ViewState issues. Analyze your web pages in real-time while you browse them using Internet Explorer 6.0 or higher. ASP.Net ViewState Helper gives you very detailed information to help you optimize your web application's performance. OpenNetSend is a free and simple Net Send GUI Tool. A network messenger that's feature-rich yet easy-to-use and install and won't cost you a fortune, RealPopup LAN chat offers fast, stable messaging across your local network. No application server required, just install on your PC and start messaging! The program lets you monitor and control your network traffic. Visualizing your Internet activity is simple - the program is easy, even for inexperienced users. You can view all established connections, monitor network traffic. Create skinnable Sticky Notes on windows desktop. Set alarms to each note, arrange notes inside memoboards to avoid desktop clutter. Send notes over network or as email. Stick notes to documents and websites. Skins are downloadable. With this small console utility you can send messages over your networkon Windows 9x/Me/NT/2000. Send your advertising message to millions of people instantly, Target your advertisement geographically! BigAnt IM is a secure and private instant messaging solution for enterprise-level communication.